Most portraits of individuals from Classical Greece are best known through copies of the Greek originals, created in late Hellenistic and Roman times, when it became popular to decorate domestic spaces with Greek art works and copies thereof. Intellectuals in these periods particularly enjoyed surrounding themselves with images of their favorite Greek statesmen and writers. 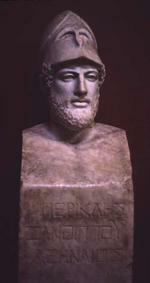 Whereas the original Greek portraits, which generally occupied civic spaces, and were often commissioned at public expense, depicted bodies as well as heads, copies more often took the form of busts or herms (rectangular shafts surmounted with the shoulder and head of the depicted individual). In some cases these copies were inscribed with the names of the individuals represented, which has been immeasurably helpful in determining which portraits depict which persons. Some of these inscriptions, however, have been found to be inauthentic, sometimes added in later times. Scholars have looked to the ancient writings as well as to the portraits themselves, for information regarding the ancient contexts and circumstances regarding portraits of historical persons in antiquity. Amy C. Smith, “Athenian Political Art from the fifth and fourth centuries BCE: Images of Historical Individuals,” in C.W. Blackwell, ed., Dēmos: Classical Athenian Democracy (A. Mahoney and R. Scaife, edd., The Stoa: a consortium for electronic publication in the humanities [www.stoa.org]) edition of January 18 2003. Contact: cwb@stoa.org. © January 18 2003, Amy C. Smith. This work is licensed under a Creative Commons License.